Nathan Gostin will be attending the Grady LA Field Study this summer, where students intern for some of the best entertainment companies. Editor’s Note: #GradyGrit is a new series of profiles of Grady College students who show determination, leadership and outreach to the community. 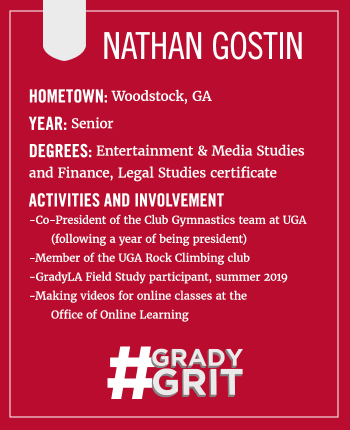 Search “#GradyGrit” on the Grady College website for additional profiles. I actually applied to Grady as a transfer from Kennesaw State, because the EMST degree really offered the best option for a film/video-centric major around the area. We’ve had an incredible amount of notable alumni and the program has an awesome hands-on approach to a lot of the learning. With that, it’s also varied in the approaches it takes to teaching. For example; Professor Biddle’s classes offer that hands-on aspect I just mentioned, whereas Dr. Fortmueller’s classes offer a very unique perspective on the business and research aspects of the field. Plus, being the #2 journalism school in the country doesn’t hurt. What are you planning to do after college with your Grady degree? Being an EMST major, I’ve had a lot of experience in different aspects of production. I produced a short film in my first semester, and in subsequent semesters I’ve done everything from assistant-directing to full post work. I really enjoy editing and post, but with my Terry degrees to compliment what I’ve learned through Grady, I think that I’d do well in a management or supervisory position with an entertainment company. Long story short: I’d love to do post or executive producing. What has been the most important skill you’ve learned in a Grady class? I think that while we’ve been taught numerous hard skills in camerawork, post, and production here at Grady, I think that the stress on soft-skills is also enormously helpful. Being a people person and knowing how to navigate the tough social circle that is the film industry is really a hard thing to master. The Grady professors definitely understand this, and I think they try to instill that sense of sociability into all of the students here, just to make the students as successful as they possibly can be once they graduate. Who is your favorite Grady teacher and why? Choosing a favorite teacher is a death sentence! In my time at Grady, I’ve had I think seven professors (Biddle, Fortmueller, Gilbert, Kavoori, Kohn, Springston, and Sridhar). I can honestly say that they’ve all brought something different to the table and that I’ve learned so much from all of them. Choosing a favorite is hard because they’ve all made an incredible impression on me, and Grady wouldn’t be the same without them. What has been the highlight of your time in Grady? Honestly, it’s probably the hell that is 3210 (Introduction to Production Basics). It’s definitely a little crazy while you’re going through it, but looking back it’s an incredible experience that brings everyone in the cohort closer together in ways that most other majors won’t get to experience. I think it’s safe for me to say that I’m pretty good friends with my entire cohort, and that is 100% thanks to 3210. Any advice to future Grady/EMST students? Future EMST students: Try hard and fail hard. This is the time to learn. Don’t forget, you’re also here to make friends. Before you know it, your classmates will either be your boss or you’ll be theirs. 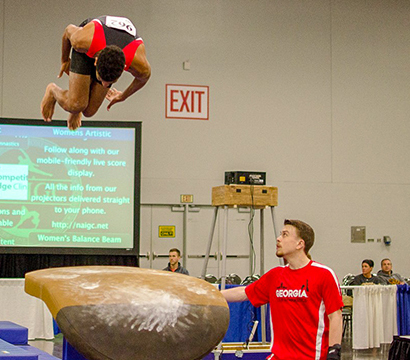 As the Co-President of the UGA Club Gymnastics, following a year of being President, Nathan shows leadership through support for his teammates. How did you get started in photography/videography? Don’t hold this against me; I think I started making videos on bootlegged software when I was in about 5th grade after watching some crazy YouTube videos from a UNC student. I continued to mess around with my mom’s camcorder and editing software as I grew up, but when I was about to go to college, I hadn’t really considered video to be something that I could make a career out of. I started out as a Computer Science major, then added Technical Communications, then dropped CS and added Business Management, and then I transferred here and started with EMST and Finance. Wild ride, I know. But as I got into college. I continued to do some video and photography personally as well as occupationally. I’ve done weddings, portraits, corporate marketing, and I currently shoot and edit video at the Office of Online Learning. I feel like creative inspiration comes from a lot of places. For me, it’s some absurd combination of films, music, novels, photography, and even people I meet. Literally everything you see has some story; it’s just a matter of putting a visual representation to that story. Oh my gosh this is almost worse than asking for my favorite teacher. I feel like I’m betraying my family. Cali n Tito’s maybe? Or Pulaski Heights ramen?? Maybe Tlaloc. Go to Tlaloc if you haven’t been. I generally stick to movies, but recently I’ve been through Mind Hunter, Peaky Blinders and Godless. I think I’ve got to go with Black Mirror honestly. Or WestWorld or Game of Thrones. I’m a slave to capitalism.